Coastal Scene Tomesode. 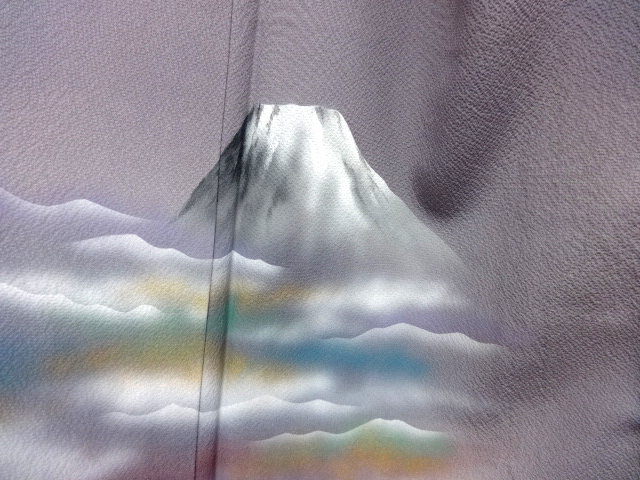 I have been looking through some photos of kimonos I bought in 2012 and this is one of them. I wish I could remember which box it is in. 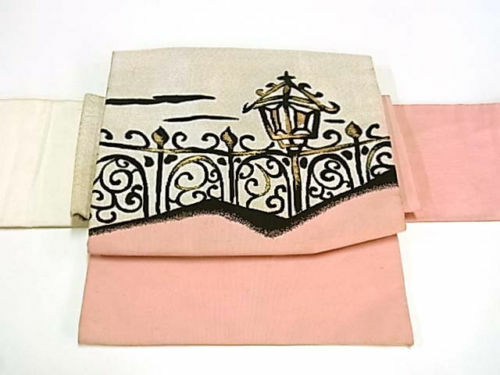 It has fabulous textile art, displaying a coastal scene. 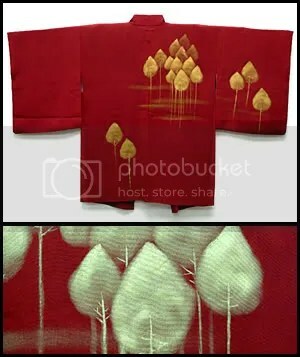 One has to have beee rich and extravagant to have commissioned a kimono with lavish and high quality artwork like this one. Huge Tiger and Lion Backpacks. I fell for these huge, great, dramatic backpacks when I saw photographs of a few people in Tokyo’s Harajuko area with them. There’s a brown tiger, a white tiger and a lion. I tracked them down and got just a couple of each to make available on www.wafuku.co.uk and got a brown tiger one for myself. I might keep one of each. Bamboo on Purple. 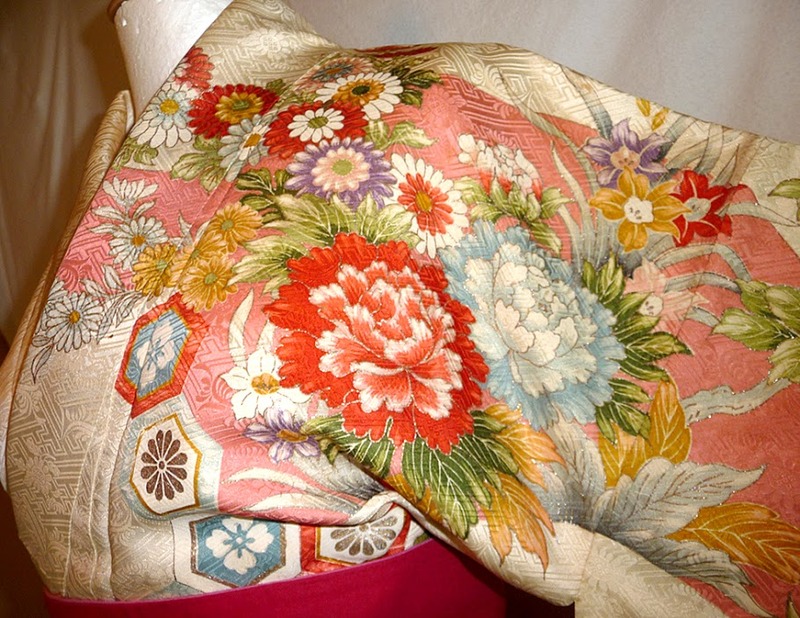 This is a silk Nagoya obi I recently added to my website. It is such a glorious colour and the bamboo is just lovely. I don’t know where the year went; suddenly the end of it is upon us. The past few weeks have been rather hectic. After years of feezing my rear off in my little cottage each winter, I had a new and more efficient boiler put in three weeks ago, when my old one died, and had three big windows double glazed to try to keep some of the heat in. Both jobs caused much upheavel so my house has been a complete mess, with stuff stacked all over the place to allow the workmen to lift floorboards, rip out windows etc. and the house ended up with a thick layer of dust covering everything inside. Having failed to expect this, I hadn’t covered much, so everything has needed washed and I’m far from finished that task. I have also, thankfully, been very busy with Christmas orders. It was ‘fun’ getting through the snow to the Post Office with heaps of packages, some of which sat in the Post Office for days as this little town was snow bound. I’ve also been helping my daughter and her fiancé to lag under the floorboards of their new flat in Glasgow and will be helping with that again this weekend, weather permitting. Talking of which, I really hope the snow doesn’t block the roads this coming week, so my daughter can be here for Christmas. Above, you can see a photo I took of a lovely uchikake that my daughter has hung in her bedroom. It’s an odd one, a child’s uchikake. 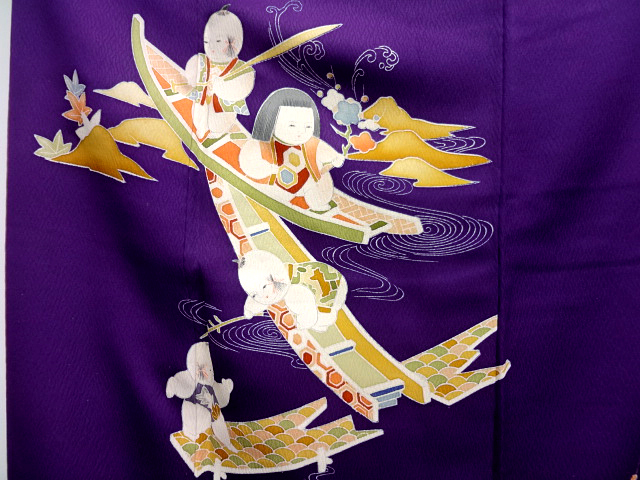 An uchikake is a wedding kimono, worn by a bride, rather like a trailing coat, open over a kimono, so it is somewhat strange to have a child’s one. I haven’t been able to find out why such a thing exists. It would fit a girl of about 7-10 uears old but girls of that age do not marry in Japan and it is not an antique or anything, so not from a time when children might marry. Someone suggestied it might be for a play or something like that but it is a very high quality garment and must have cost a huge amount originally. I can’t make sense of it but it is a beautiful thing and much easier to display than an adult’s uchikake, being much smaller. Below, you can see the faric close up. The entire backgound of the fabric has gold woven through it, so, when the light hits it a certain way, the entire kimono shines gold. The bouquets of flowers and the trailing cords are embroidered. 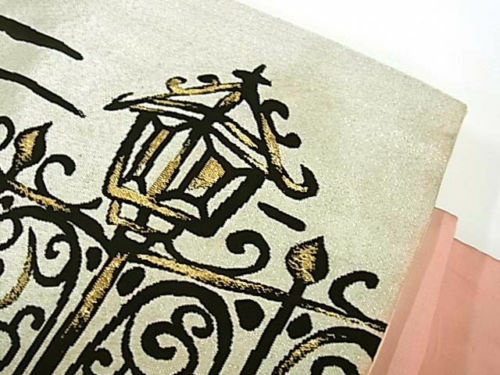 The picture below shows it closed, as it hangs on my daughter’s bedroom wall, above the bed, though the photo isn’t very good quality and does not do it justice at all. This is Vicky Barton, telling me that she loved the kimono she got from me. She sent me the photo you see below, of her wearing it. Vicky kindly said I may add the photo to my blog, so you can see her below in a very Japanese style garden, holding a very menacing Japanese katana (sword). The kimono Vicky is weraing has lucky mallets and lines of kanji (Japanese text) all over it. This summer there were some Japanese people visiting my mother. 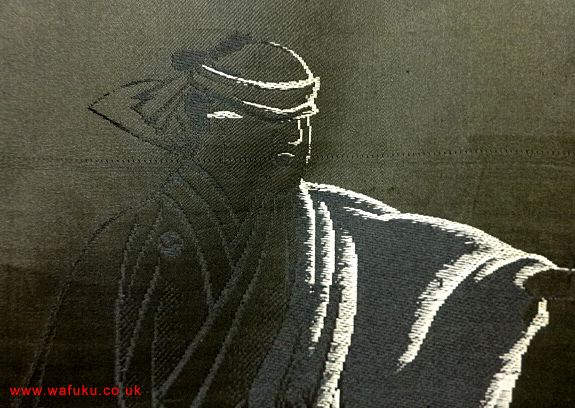 In the next photo, taken that evening, we are holding an embroidered obi. I am very petite, just under 5′ 2″, although my tabi boots do have 2 inch heels, but you can see how petite the Japanese lady is; it’s quite a novelty to me to stand beside an adult who is smaller than I am. The kimono she is wearing is a cotton yukata kimono. 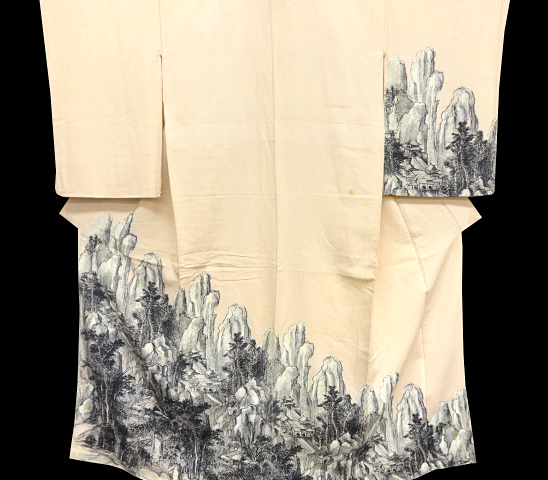 Yukata kimonos are casual kimonos, worn in summer, particularly as robes at home and at summer festivals; any time in summer when one wants to dress casually. 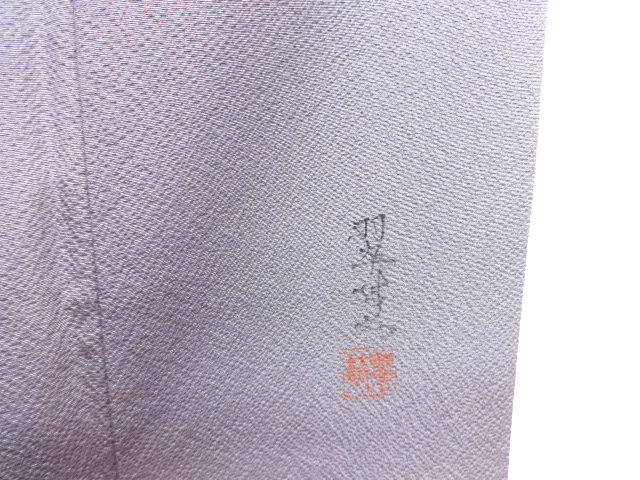 The obi worn with a yukata is called a hanhaba obi and is narrower than the more formal obis and much easier to tie. When wearing geta or zori shoes with a yukata, one wears them with bare feet, not with tabi socks. With more formal kimonos, one would always wear tabi. 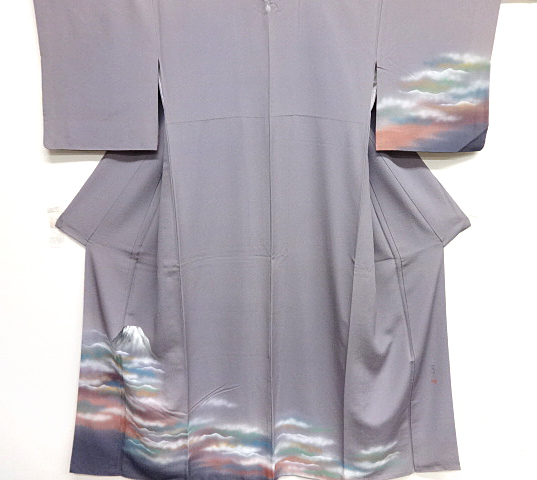 A tomesode kimono, with fishing village scene. 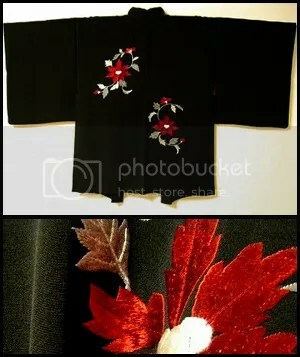 A black silk haori, with a striking, red itogiku (spider chrysanthemum, also called rangiku). 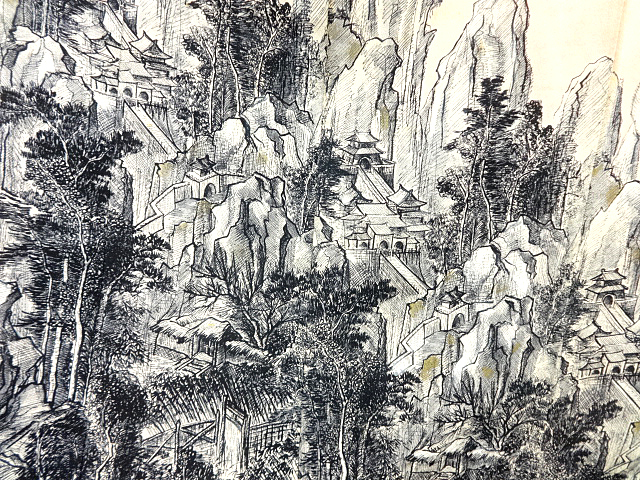 A black, silk haori, with stunning, metallic urushi (lacquer coated silk thread) mountains and mist. 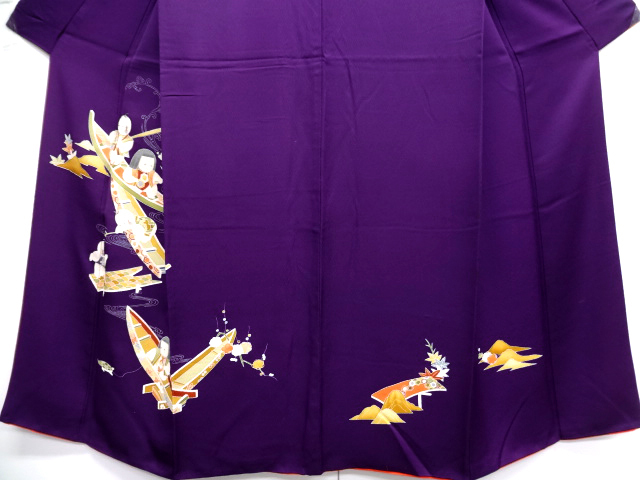 I know I must not buy more kimonos, I can’t move for the things and my home is now a warehouse with them crowding me out of every room but I could not resist the exquisite uchikake kimono you see below. It was expensive, as was the shipping from Japan, since it weighs about 6 kilos, so I can’t keep it and it will end up for sale on my website but I get to own it briefly, at least, and that will do. I have nowhere to display it anyway and it does not deserve to be hidden away in a box. It hasn’t arrived from Japan yet but I am quite excited about seeing it up close. 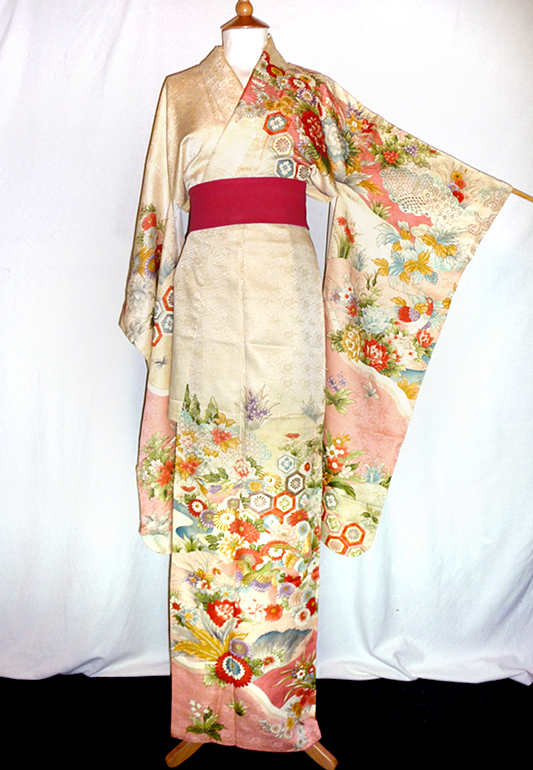 An uchikake is worn by a bride in Japan, part of one of many outfits she wears on her wedding day. They are not worn with an obi, they are worn open, rather like a coat, over her kimono and obi. 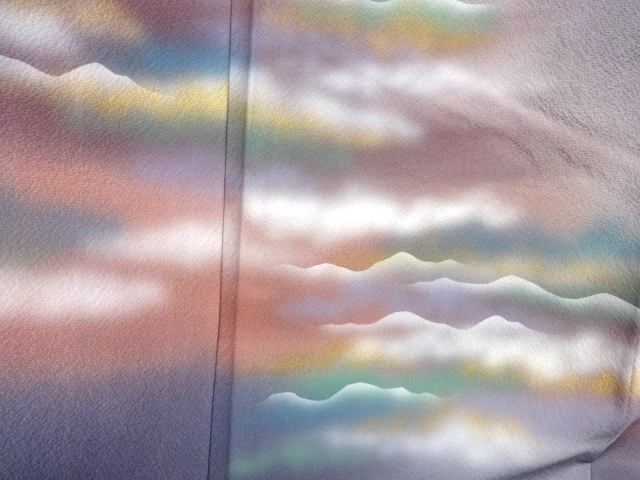 It has magnificent aranami (wild waves), flying tsuru (cranes) and kumo (clouds). 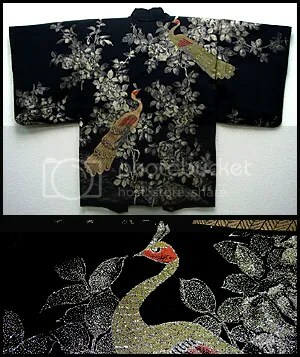 Cranes are a popular motif on wedding kimonos, as they are symbols of longevity, fidelity and loyalty. The Japanese believed cranes live for one thousand years. They mate for life. 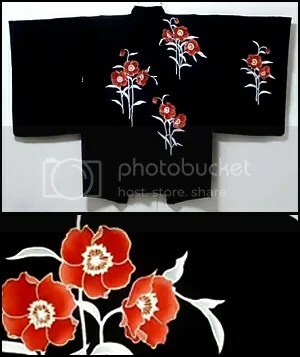 On the front and on the back of one sleeve are red botan (peonies), symbolising happiness, wealth, and honour. 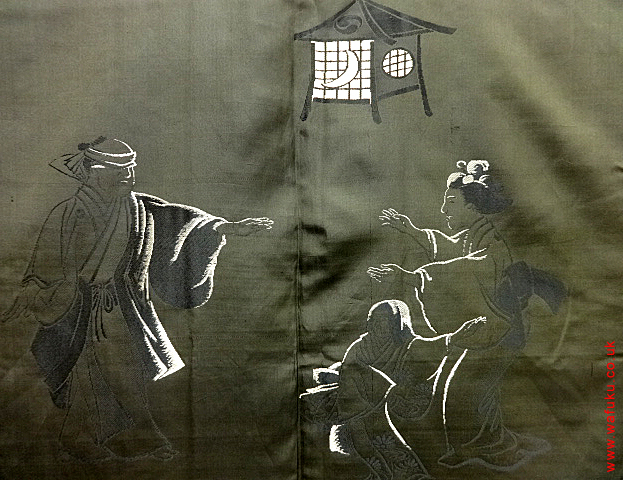 This uchikake is pure silk and has yuzen textile art, which means it was hand painted on the bolt of fabric used to make it. It will have cost ten to twenty thousand pounds, easily. In Japan, brides usually hire the uchikake for the wedding day, which will still cost a couple of thousand for the day’s hire. This makes buying a vintage one, for wear or display, a real bargain, as it will only cost a few hundred pounds and you get to keep it. It’s 4:15am and I’m not long home from visiting my daughter in Glasgow. We spent the latter part of the evening and a couple of hours into the morning taking photos of kimonos, which she models, for my site. After about 4 hours of taking the photos while she poses, I always seem to have an exceedingly sore back, her arms ache terribly and we are both tired out but we then still have to fold all the kimonos the traditional way and pack them up for me to bring back home. She is terribly patient and does this for me every 2 to 4 weeks. In the photo above, you can see stacks and boxes of kimonos, haori and obis. There are around 60 kimonos and haoris in that photo and about 20 obis plus a smattering of other items, just a tiny droplet in the ocean of wafuku (traditional Japanese garments) I own. About two thirds of the items in those stacks are the kimonos she modelled tonight. Tomorrow I start rotating, resizing and colour adjusting the photos, to make them ready for use, which will be a full two or three days of work. As soon as I got home, aching and beginning to seize up a bit, I rewarded myself with an entire 500ml tub of Häagen-Das, pralines & cream ice cream. Now wishing I’d stopped eating half way through, even though I felt I deserved the entire tub. 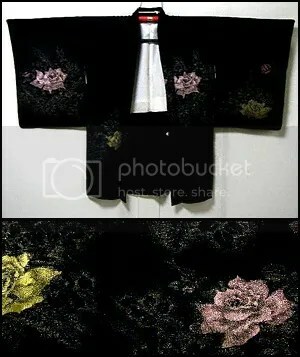 The haori above is black silk, with embroidered flowers and leaves. 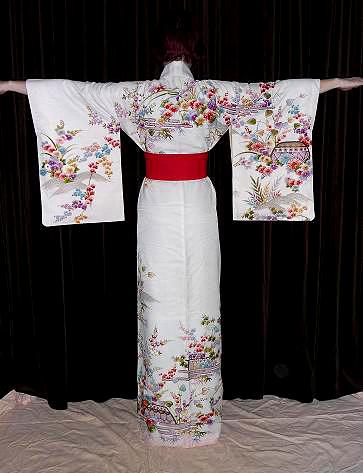 A haori is a long jacket with deep, swinging, kimono style sleeves. About two thirds of the depth of the sleeve is not attached to the body of the garment. Haori are made to be worn over kimonos but look great worn with western world clothing; dressed down with jeans or dressed up with a dress. Here I show womens’ haori but I also have many mens’ ones. 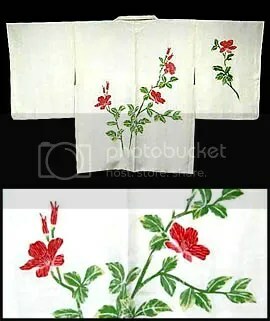 Mens haori are less decorative than women’s, though the linings often have fabulous textile art, and mens’ kimono and haori sleeves are attached either all the way down the body or to about an inch or two above the bottom of the sleeve, whereas womens’ sleeves hang free from the body for a large part of their depth, so that a deep obi can be put round the kimono. As men wear much narrower obis, the sleeves can be attached much further down. 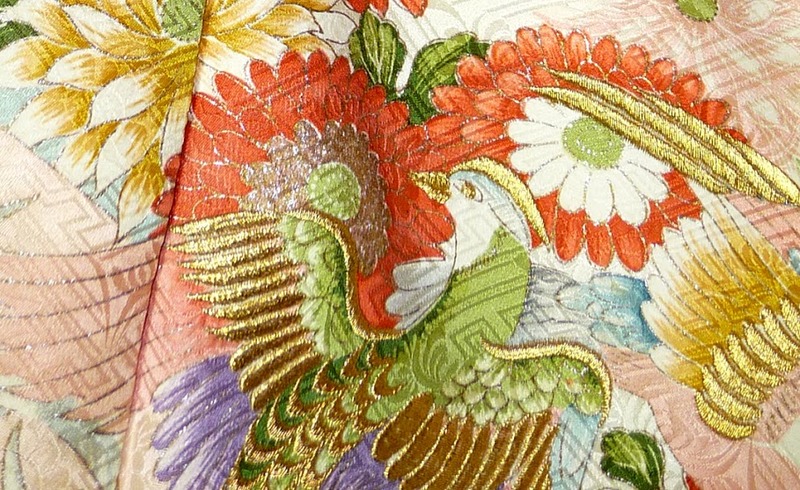 The haori below has wonderful peacocks, woven in metallic, urushi (lacquer coated) thread. 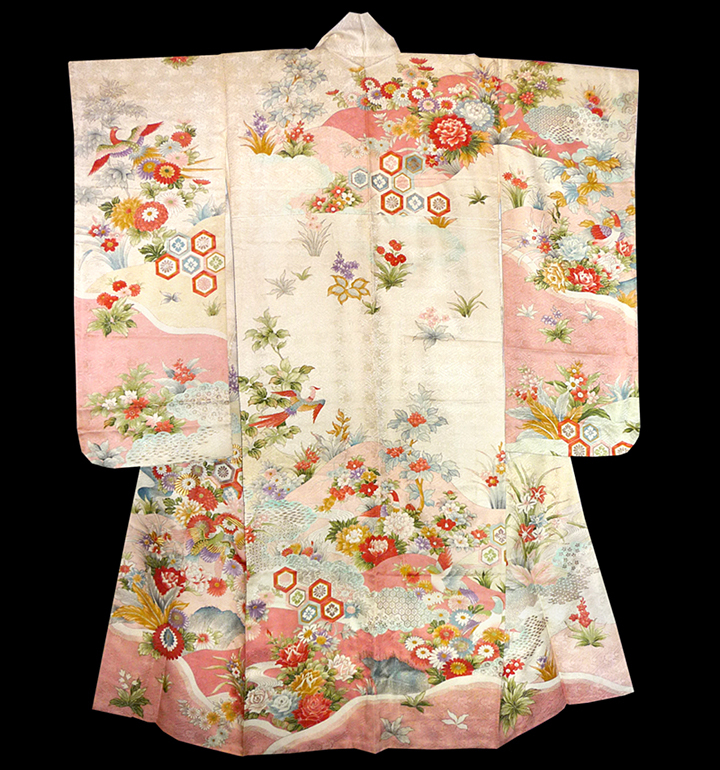 The next haori shown here is a nice example of a light coloured one. 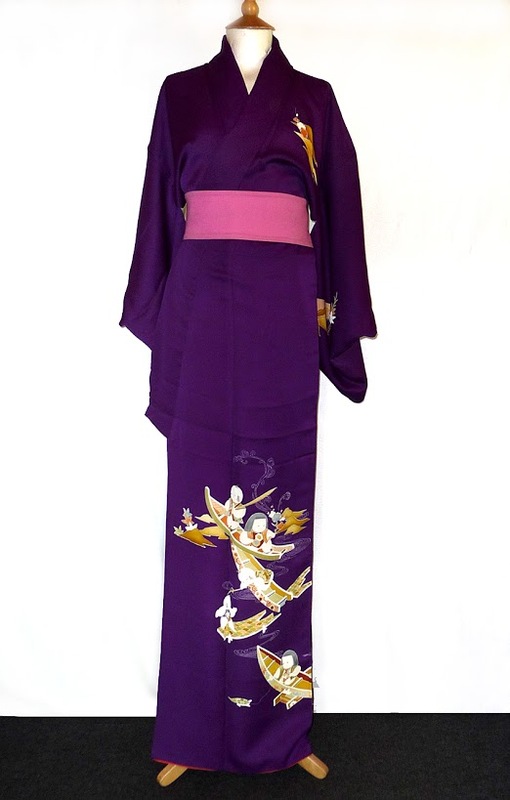 Like most vintage haori, it is entirely hand tailored. 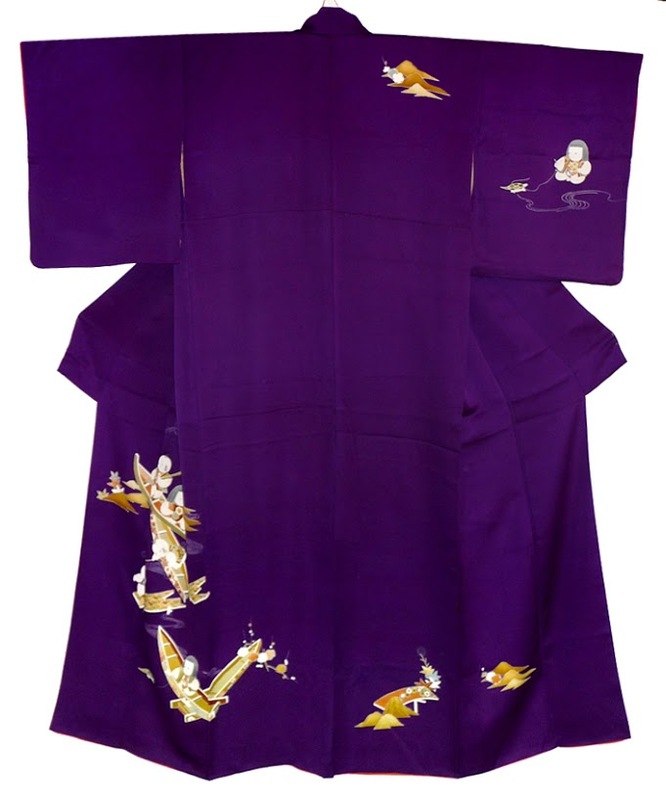 Where a kimono is a fabulous item to wear in the house, here in the West, I find haori are very versatile and useful garments and I have several of my own that I wear quite frequently. My greatest weakness is for ones with Japanese people on them or with gosho ningyo (imperial dolls), which are very white (to look like porcelain), chubby little figures. 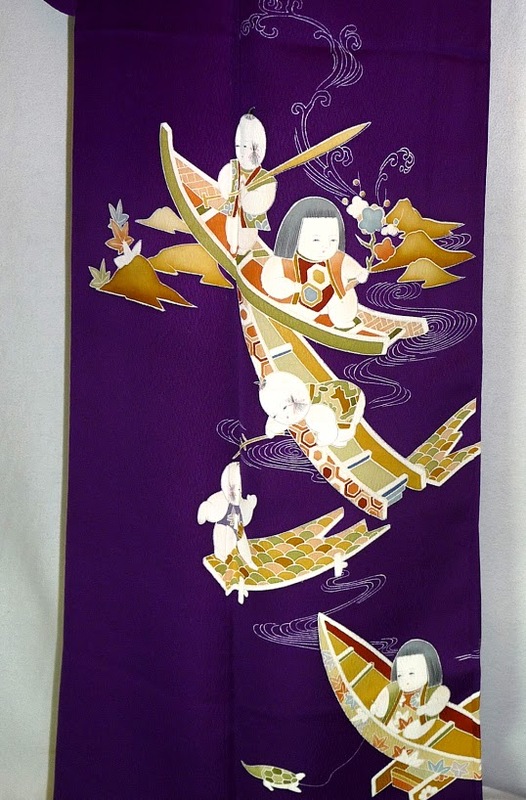 Below is a picture of the front of a haori. 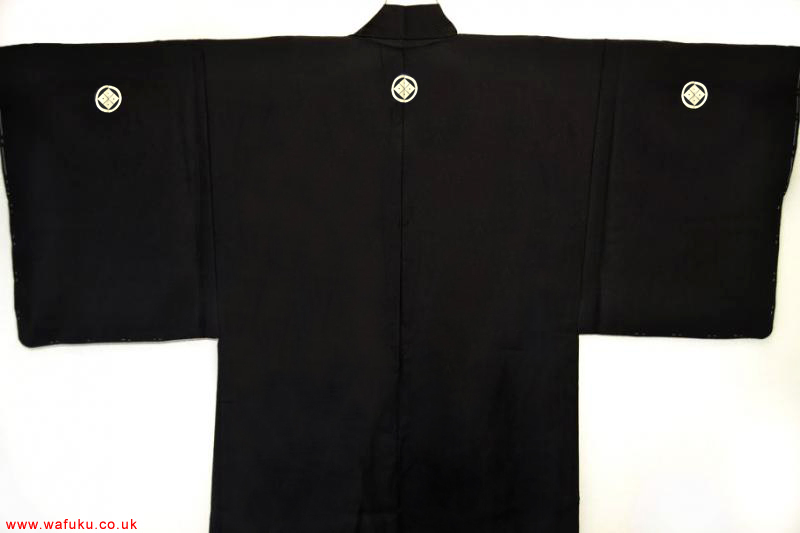 Unlike kimonos, they are not worn with an obi sash. 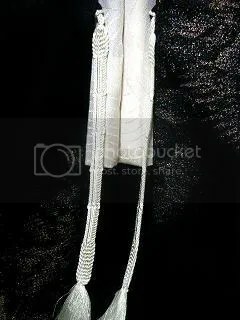 They are worn open or can be fastened by attaching a pair of ties, called himo, to the inside edge at the centre, where there are two little loops. 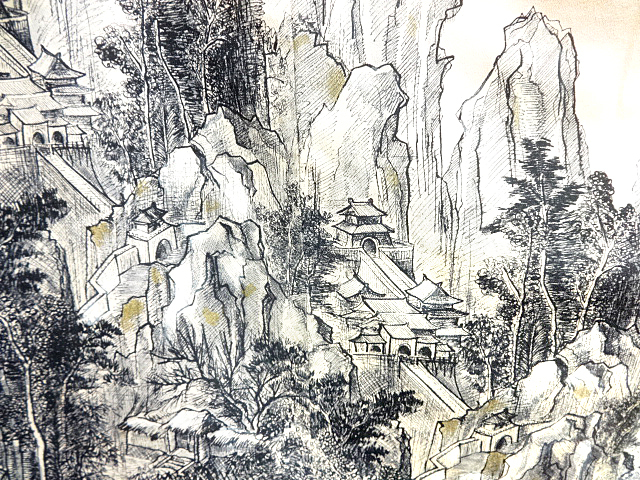 Below, you can see the himo attached to the haori with the roses, shown above. Below that are instructions for tying a woman’s himo. 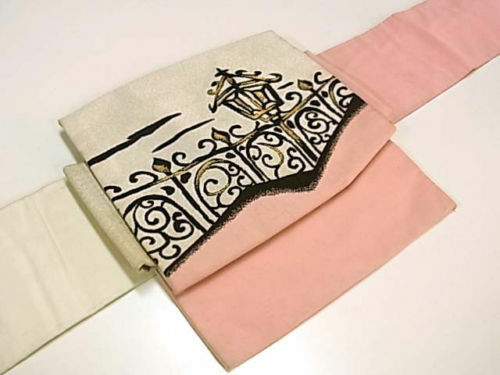 Men wear haori too, though theirs tend to be less decorative on the outside. 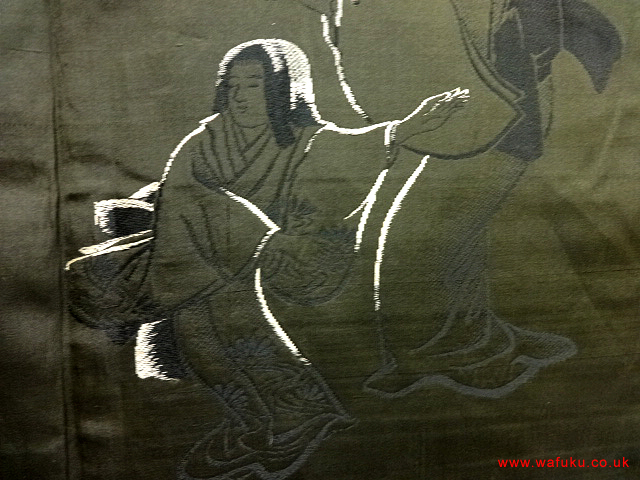 The lining of a man’s haori often has fabulous textile art on it, considered ‘hidden beauty’. There is a section in this blog all about that, if you wish to read more on the subject. How to tie a man’s haori himo can be seen here. Men’s himos are hooked onto their haoris and are not untied to open the jacket; to unfasten the it, you just unhook the himo. Men’s himos are tied differently from womens and are bigger. 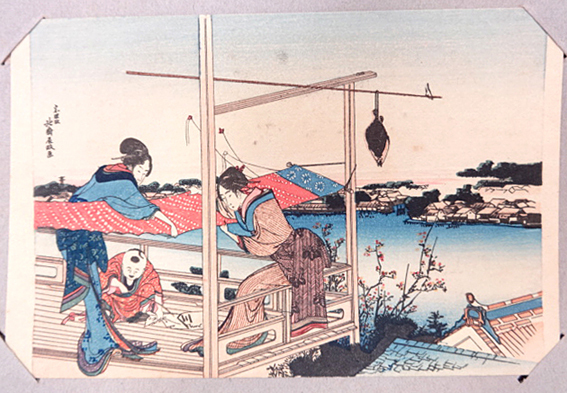 Men;s are usually tied so that the man’s haori lies slightly open and the himo shows.